Playa de Las Canteras is a beach like no other. Located northeast of the capital city of Las Palmas, it is one of the best urban beaches in Europe. Running parallel to its sandy beach is a long busy promenade filled with the shops, restaurants, and bars. Aside from the usual beach activities, it is also a haven for surfers and scuba divers. For some visitors, choosing to go to a crowded beach is both a matter of location and convenience while others prefer secluded ones. Families and couples might prefer tranquil waters or a rich marine reserve while surfers would prefer rougher waters. Playa de Las Canteras offers the best of both worlds. The 3-kilometer strip of golden sand makes it the longest beach in Gran Canaria. Playa de Las Canteras, nestled between La Isleta to the north and Santa Catalina to the east, is a favorite spot for tourists who love the modern amenities of its seafront promenade. Despite the abundance of shops, restaurants, and bars, visitors marvel at the cleanliness of the surroundings. In fact, Playa de Las Canteras is one of the only three beaches in Spain with an environmental accreditation. The sandy shore, coupled with a favorable climate, attracts lots of couples and families every year. For safety, there are flags scattered all around giving ample warning for swimmers. Furthermore, there are lifeguards on duty. One of the best features of Playa de Las Canteras is La Barra, a reef that runs parallel to the coast. As a natural barrier, this section of the beach called Playa Grande is the most visited due to the relatively calm and safe waters. As guests basked under the sun or take a dip in the sea, the reef itself is a haven for marine life and frequented by scuba divers. Away from Playa Grande where the open water is unprotected, the surface condition makes it ideal for surfing. As such, there are surfing schools and shops to cater to beginners and seasoned veterans. The seclusion of a beach in itself is an attraction for beach lovers who prefer to stay away from tourist traps and the crowd. 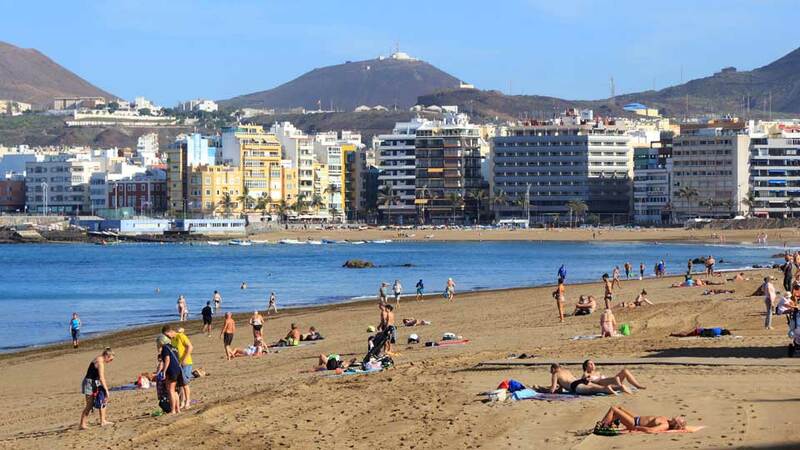 For most visitors staying at Las Palmas de Gran Canaria, modern amenities and proximity make Playa de Las Canteras a likely destination. Playa de Las Canteras is only four city blocks away. For most visitors, it should not take more than fifteen minutes to reach the beach. For visitors in cruise ships, Playa de Las Canteras is only a five-minute stroll from the pier. If opting to take a taxi, the initial charge is 1,65€ and an additional 0,60€ for every kilometer. There are also a lot of car hire companies in Gran Canaria. For most visitors, hiring a car is the easiest and best way to explore the city and get to Playa de Las Canteras, as well as visit the other destinations around the island. Las Palmas has one of the best bus systems not only in the Canary Islands but also Spain. Bus nos. 1 and 12 take visitors to Playa de Las Canteras for the standard fare of 1,40€. Convenience stores around the city also sell bus tickets good for ten trips at 8,50€ and 1,50€ card fee. Moana’s father in the hit Disney animation didn’t want her to leave. “The village of Motonui is all you need,” he said. And that is what it feels like to stay in Playa de Las Canteras. It has everything guests could ever need. Along the 3 kilometers of golden sand, love is always in the air. For couples taking a stroll, the day ends with a breathtaking sunset that paints the sky with romantic shades of red, orange, yellow, and gray. Most visitors, especially families with kids, opt to stay at Playa Grande and for a good reason. The waters are calm and safe as La Barra protects it. Another section of the beach, Playa Chica, is a great spot for snorkelers. From the shore, one could swim out to the reef and spot amazing aquatic animals including moray eels and octopus. For solo travelers, sunbathing while reading a book or listening to music is quite an experience in itself. Speaking of food and drinks, one does not need to go far. Adding to the perfect beach experience is Paseo de Las Canteras. The promenade is filled with many choices of food and drinks. Most of the restaurants and cafes offer al fresco dining near the seaside. After a day at the beach, the fun continues well into the wee hours of the morning in one of the bars. Another fun thing to do at Playa de Las Canteras is to go shopping along the boardwalk. For instance, Las Arenas Shopping Center, the biggest in Las Palmas, is at the end of the promenade. A side attraction while walking on the promenade are the statues and sand sculptures that make for an enjoyable cultural experience. Even better, take selfies and post on Instagram for all the world to see. In Las Canteras, vacationers on Facebook could post “feeling spirited” on their status update. And that is because of the adrenaline-charging activities the beach has to offer. La Cicer, where there is no reef protecting the shore, has all-year surfable waves. As such, specialty sports shops abound in this area for visitors to rent or take lessons in surfing. For the experienced surfers, La Puntilla at the far end of Playa de Las Canteras is where the action is. While snorkeling on the reef is fun, no other activity could compare to the exhilaration of floating weightless in underwater. There are scuba diving schools which offer courses or experience dives in the area. The marine reserve is an excellent spot for diving and close encounters with amazing aquatic animals. It is easy to understand why Playa de Las Canteras is one of the most visited destinations in Gran Canaria. The beach and the activities cater to the needs of all travelers – that of relaxation and adventure. Combining the best that nature has to offer and the modern conveniences, it is no wonder that many of the visitors are returning guests.